Terminology: What is blonde lace? One of the most striking features of Queen Adelaide’s frock in this week’s Rate the Dress is her glorious blonde lace sleeves. Perhaps you’ve read a Georgette Hayer novel and come across a description of the heroine heading out to a dinner party in a dress trimmed with blonde lace and wondered what that meant. Maybe you already knew, if not, wonder no more! ‘Blonde’ is the term used to describe the natural colour of undyed silk, and blonde lace was originally the name for a specific style of continuous bobbin lace made in France (primarily Chantilly, Caen & Bayeux) from natural, undyed silk thread imported from China. While blonde lace was originally made from undyed and unbleached silk the name later came to refer to lace in a particular style made from silk thread, even if it was bleached white, or dyed black (and occasionally other colours). 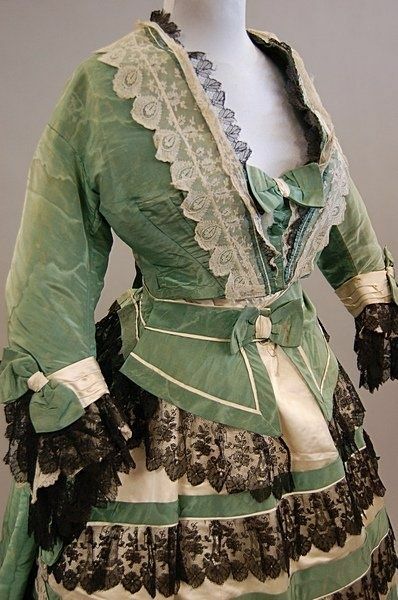 In 1902 an ad offers it in white or ‘butter’, and a fashionable 1895 tea jacket is made up in ‘black blonde lace’. Sometimes different shades were be combined in the same garment, as in an 1890s blouse in brown and white blonde lace. 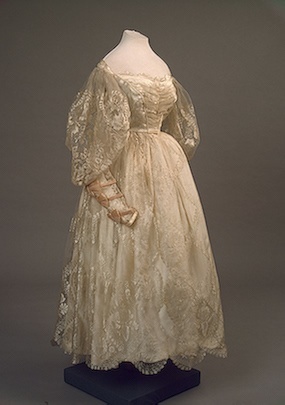 Gown of watered silk, ca 1865, bodice w: cream & black blonde lace (I think). Vendor unknown. 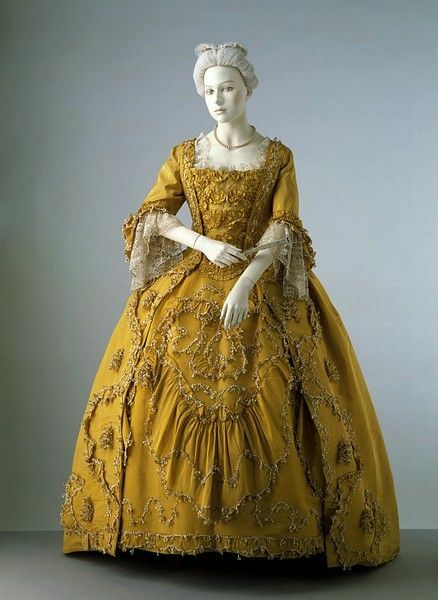 Blonde lace was made from the early 18th century, and was wildly popular throughout the early 19th century (hence its popularity with Hayer’s heroines). Almost every lady who attended court in the 1830s is described as wearing blonde lace. 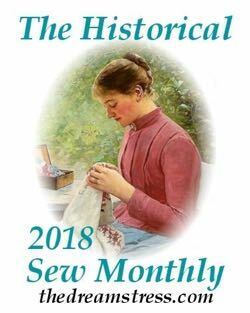 It’s immense popularity allowed it to withstand the decimation that the handmade lace industry suffered with the introduction of machine made and hand-embroidered bobbin net in the 1820s. Machine version of blonde lace were available from 1833, leading to a slight decline in the desirability of the lace. The blonde lace industry was rescued by the growing middle class and their demand for cheaper lace, and by a change in the aesthetics of blonde lace. Early versions of blonde lace were very light and delicate, with small floral motifs widely scattered on a delicate net background. 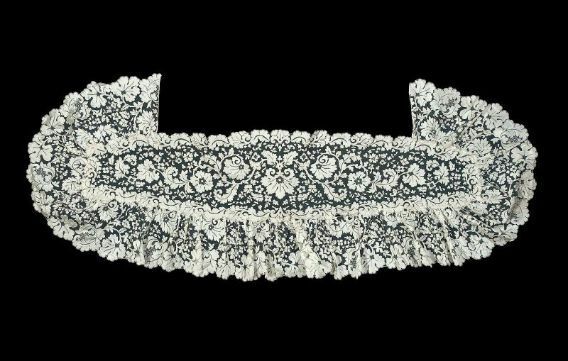 From the 1830s the motifs on blonde lace became heavier and closer together, and vast quantities of it, usually in black, but sometimes in other colours, were imported into Spain and made in Spain, where it was used for mantillas. Blonde lace was sold in New Zealand from at least the late 1840s and into the 1940s (though the 20th century versions are almost exclusively machine made). Though it was very popular for dresses in the early 20th century, and blouses and trim throughout the 1920s, by the 1930s it’s popularity was in decline, and in the 30’s and 40’s it was rarely used except for wedding dresses. 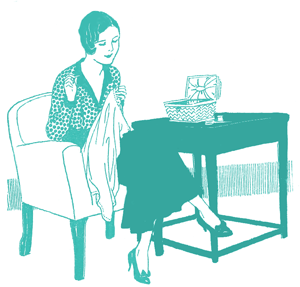 World War II finally saw the demise of blonde lace except for in very specialised couturier garments. As I understand it, ‘Blonde’ lace looks like a simpler version of chantilly (not surprising, since they were made in the same region): fairly naturalistic floral motifs scattered on a net background. Blonde lace was easier and cheaper to make than chantilly: the net isn’t as fine, and the designs aren’t as well incorporated into the net, and is worked in bigger thread than that used for the background net (so blonde looks more embroidered on). So basically you’re looking for a very fine background net and scattered flowers worked in thicker thread. Agreed that modern laces just don’t cut it! Whenever I find some I approve of I get really excited and buy a bunch, because you never know when you’ll have the chance again! This was very educational! Thanks. The black blonde lace lace is something I will remember just because of the wording. I found your article really interesting. 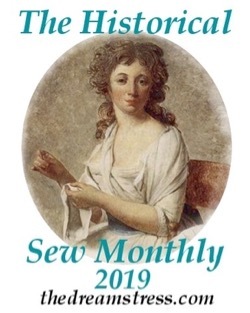 I am becoming so interested in this whole subject ( historical clothing) that I am going to figure out how to learn more. Will be googling into the night. The internet is a wonderful learning place. Fascinating, the way meanings change. As an older person, I find myself frothing at the mouth when people use words in a way in which they just do not mean what I know (ha!) they mean. Black is white – now blonde can be black. Groan. I know, I know – it has ever been thus. Well, I thought I knew… I was aware blonde lace meant the natural silk colour, but I wasn’t aware that later it came in other colours and I did not realise it is a distinct aesthetic style. 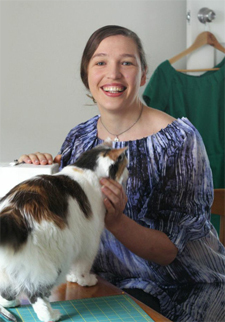 Next PostWant to sew along with me?